Sephora has recently added a few new lashes to their False Eye Lashes line, and I've been trying out the Paparazzi lash* ($12 CAD). I normally only wear false lashes on nights out, they aren't part of my daily makeup routine. I spent this past weekend I went to visit my bff, and I decided to rock some falsies on our night out. 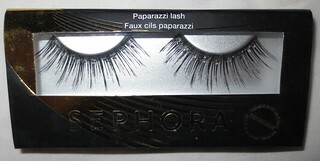 The Paparazzi lash will definitely make a statement, so they aren't for the faint of heart. These lashes come with lash glue, which actually works quite well. I applied the glue to the lashes, and waited about 30 seconds for the glue to get tacky. I then applied the lashes to my lash line, held for a few seconds, and voila! The glue dries to a clear finish, which is perfect. These lashes are quite large, so be sure to apply starting at your inner corner first. These lashes also have some glitter pieces at the lash line, which I find so fun! You can really only see the sparkle when you blink, or when your eyes are closed. These lashes stayed on all night long, but they also removed very easily at the end of the night.